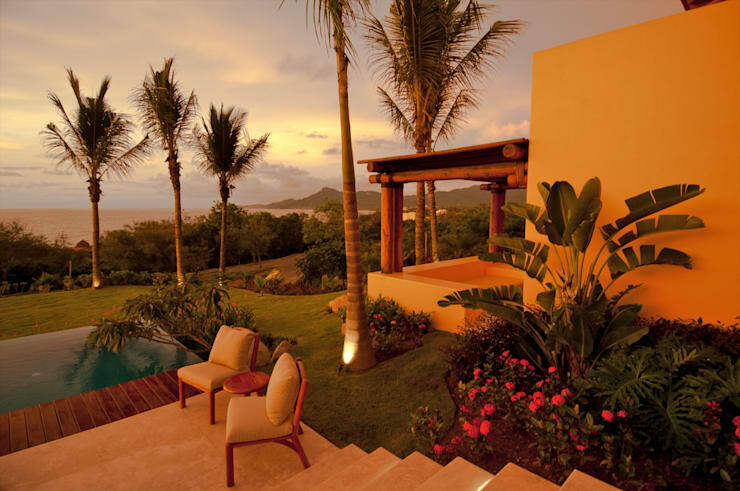 When we think of romantic and exotic places, tropical gardens are definitely one of the first places that come to mind. Tropical gardens ravish the senses and bewitch the mind. If you’ve been so lucky as to travel to Southeast Asia, the Caribbean, Central America, or the Pacific Islands, you know first hand just how beautiful tropical gardens can be, how relaxing they feel, and how marvelous they smell. Have you ever wondered if you could have such a sensory-enthralling thing in your backyard? Well, there is a way to achieve a similar atmosphere where you can enjoy the glamour and tranquility of these gardens, and here at homify, we can tell you just how to do that. The addition of a tropical style garden will provide a unique atmosphere to your home and even add great value to your property. So why wouldn’t you want to include this beautiful element to your home? If you're interested, keep reading for a few tips and tricks to help you create the perfect tropical style garden in your backyard. You can grow tropical vegetation in many hot climates, even in dry and parched climates, but you need to be knowledgable about and choose the right type of plant for your specific climate. Generally speaking, tropical vegetation loves continuous hot and humid climates throughout the year. Of course, you can still grow tropicals in any warm climate, but a less than ideal environment will make your plants grow slower and produce smaller plants with fewer flowers, so you want to make sure whatever you choose can thrive in your climate without much effort on your part. Usually, resilient tropical plants flourish with full sun exposure, while more delicate tropical plants such as ferns and orchids prefer filtered light and can be more fussy about fluctuating temperature. If this seems too impractical for your area, don’t worry! There are some tropical plant species our there that can even live in places with mild frosts. If you live in a climate with severe frosts or long winters and short summers, then you would benefit greatly from growing your tropical garden indoors. Majestic or unkempt – these are the looks your tropical garden can have due largely in part tot the type of soil that is used to grow the plants. So the moral is that the soil is the primary starting point to make sure your garden will thrive. Tropical plants love rich soil that can easily drain water. Most tropical plants don’t like to have their roots wet, so that means they don’t like to soak in water for long periods of time. Soaking your plants for a long time also leads to the growth of mold and fungus at the roots, which will harm the plant. Some species like soil that is similar in makeup to mulch. These types of plants include Orchids and Bromeliads. But most tropicals will thrive in any free draining soil, preferably with some organic matter in it. Applying a nitrogen rich organic based fertilizer with some mulch and water for optimal plant growth and health. You should be mindful to apply fresh mulch each year so your plants keep growing strong. What plants grow in your region? Educating yourself on which plants grow naturally in your region will be extremely helpful when planning your tropical garden. If you live in an area that is home to Hibiscus, Indian Pink, Iris, or Bee Balm, then you know you have the absolute best climate around for creating the perfect tropical garden. These plants enjoy full sun (but also some shade now and then) and moist, well drainable soil. If you see wild Anemone, Lady’s Slipper Orchids, or Carolina Lupin, then lucky you! 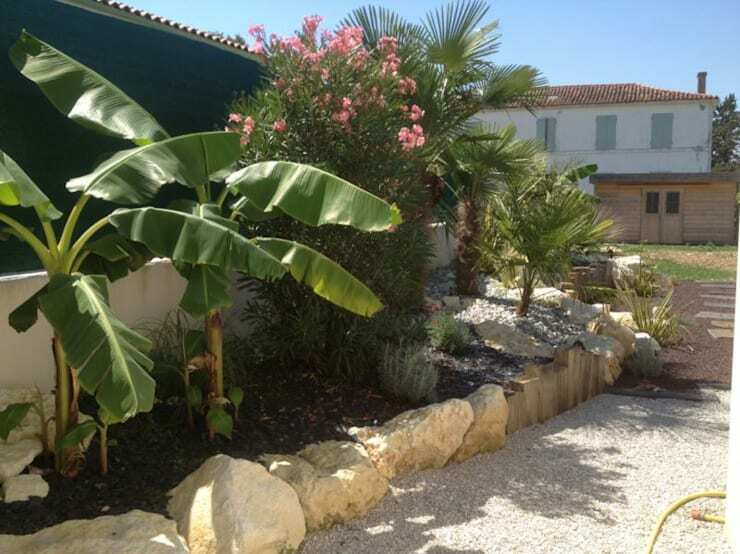 You also have great conditions for a tropical garden. Though these plants are partial to shade and a bit of sun and well-drained soil. If you don't happen to have these types of plants, but you see a lot of Foxglove, Hollyhock, or Lavender in your area, it means you live in a somewhat colder climate, and it might be better for you to build your tropical garden indoors, or better yet, in a greenhouse. You can incorporate a vast array of different plant pots to give make your indoor garden a tropical paradise. Plan the layout of your garden and do it well in advance to buying anything, as planning takes a lot of time. Ideally, you should reflect on your intentions for your garden. 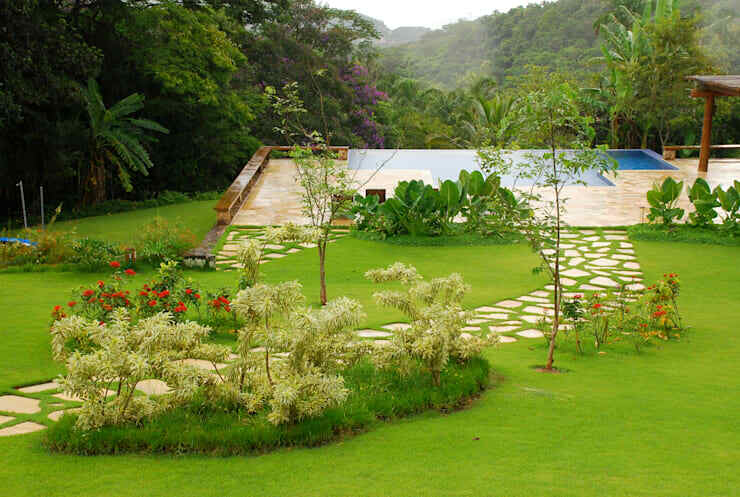 Are you creating a tropical garden purely for aesthetic enjoyment? Or are you looking to create a serene outdoor space for relaxation? Or maybe for your children to play in? Any of these intentions require careful thought before you start planting. 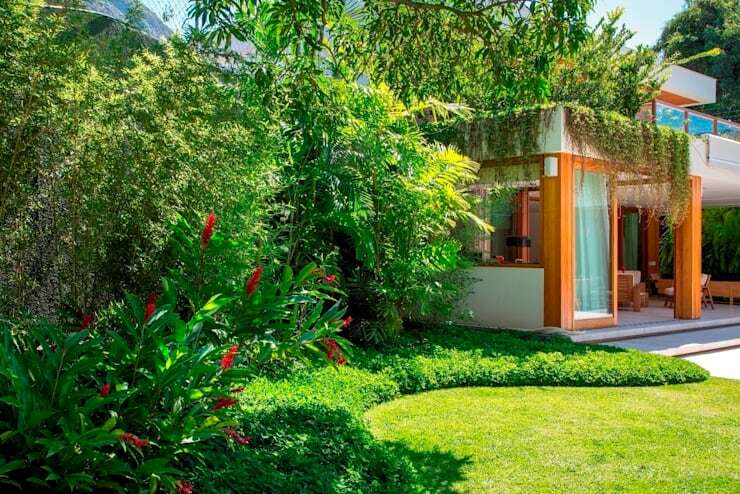 A designated grassy area is quite common in tropical gardens and is perfect for each design listed above. 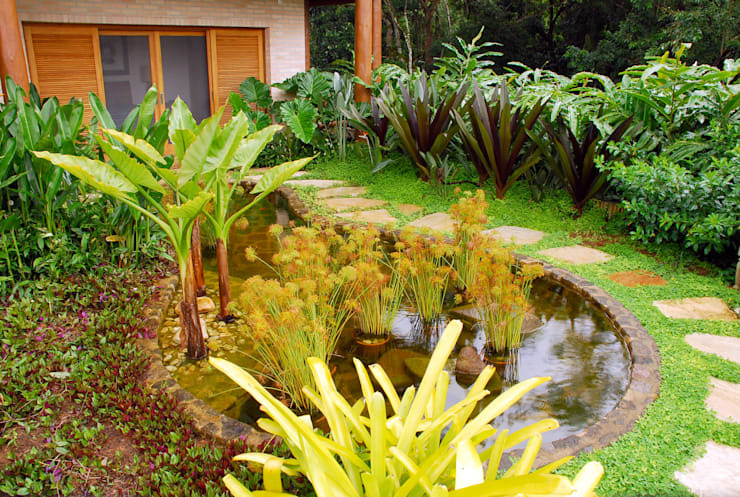 Adding a small stream or pond would be the perfect if you're just going for aesthetics, but it's also perfect for creating that relaxing environment. After all, what's more tranquil and relaxing than listening to the sound of trickling water while you enjoy the lush foliage of your tropical paradise? When planning, you also want to make sure that the garden isn’t too crowded with plant life. It may sound strange, but there's a good reason for this – you want to be able to move freely in your new space. If you live in a particularly hot or dry climate, be sure that there's some shade available for any plants that may require it. One way to achieve that beautifully shaded garden without adding unnecessary umbrellas or walls is to plant drought-proof trees such as Jacaranda, Carob, or Desert Palms. But do choose wisely, as some of the plants most tolerant of your conditions tend to be invasive species that could hinder and perhaps even wipe out the other tropical plants in your garden. If you’d rather avoid that risk altogether, though, then by all means, strategically place umbrellas, walls, or even canopies in your garden. 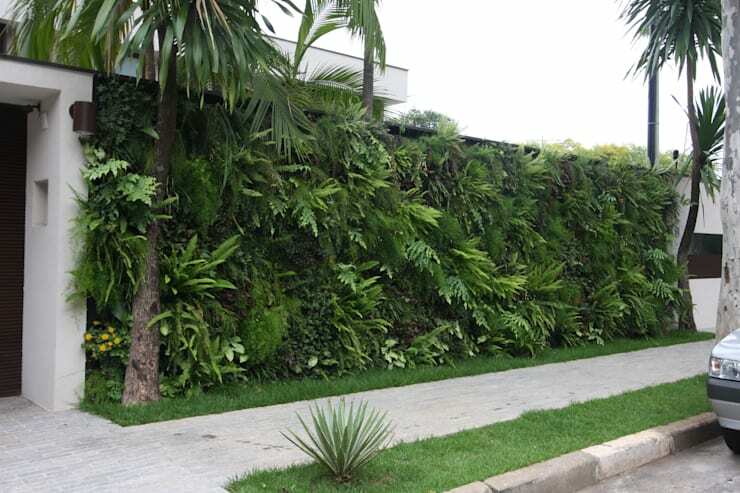 As we can see in this image, a wall with vines on it can provide excellent shade for your plants, but be mindful that it will only be at certain times of the day. Tropical plants are very easily damaged by wind. If you live in a windy area, then installing hedges will help to reduce the impact of these strong winds and keep your tropical garden thriving, while simultaneously adding a little extra foliage to your layout. Of course, it’s still very important to ensure that there's some air movement. Plants need air movement to grow, so taking it away will hinder plant health either straight away or in the long run. 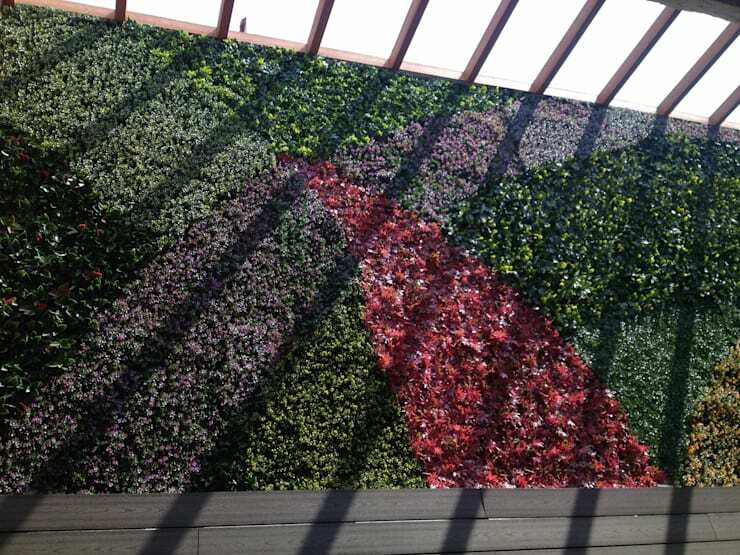 You could also use living screens such as Bamboo, Lillipilli, hedging bougainvillea or Hibiscus. These all help reduce wind damage and will add to the aesthetic charm. But whatever you do decide, be sure that you install this wind protection before you plant your tropicals. If you don’t have the proper protection installed first, you risk losing your plants to the elements before you even have a chance to enjoy them. Just like with any redecoration project, adding accessories will really bring it all together. Consider investing in brightly coloured banners and flags, or sculptures. 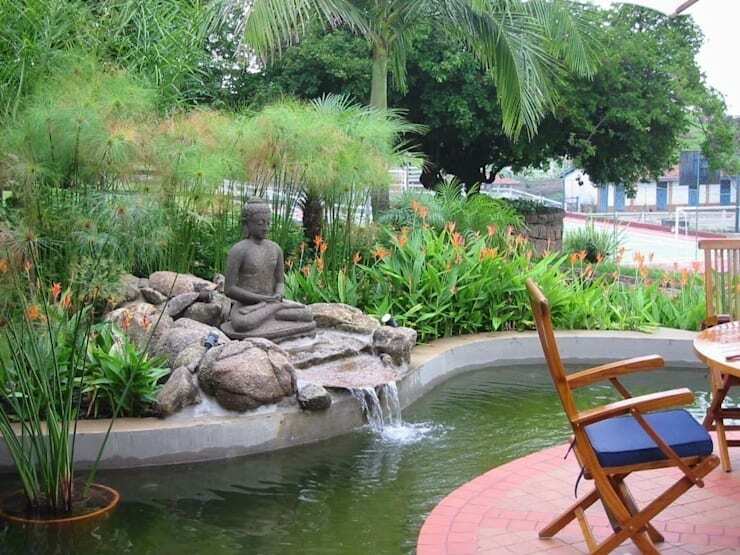 Buddha statues or Polynesian, Balinese or other Asian inspired ornaments will bring your tropical garden to life. For outdoor gardens, statues made from durable rock are ideal, but you can also buy fibreglass statues for a low cost, lightweight, and easy to install ornament. If you have a lot of large rocks in your yard, you can clean them, lightly coat them with glue, and then cover them with red or brown coloured sand. This will provide your garden with excellent contrast and will make use of those big, but unattractive boulders you’ve been wanting to do something about. When the glue dries, your rocks will give your garden an authentic tropical feel. Candles, lanterns and torches are also good to add character and that jungle feel. Now that you’ve created the perfect tropical style garden, you need to educate yourself on the maintenance of the flora you’ve chosen. Although we can’t get into the specifics of each plant you could buy, we do have some general maintenance advice for you. Regular maintenance includes ensuring mulch levels are kept up and refortified, as well as removing old palm fronds and flower heads. The occasional pruning is also necessary to make sure you get new growth. You should also keep garden border clean, so you don’t have weeds coming in and taking over what you’ve worked so hard to achieve. Pruning tropical should not be done before or during winter, as this may prove counter-productive and deadly for the vegetation. Pruning is best done when there will be a long period of warm weather so that the plants have time to grow back. Lastly, any moss you find on pathways should be cleaned off fairly consistently, as it can be slippery and unattractive. Now that you've read this Ideabook, are you ready to create your own tropical style garden? Let us know in the comments section below!